2 0 1 9 M A R C H P R I N T W E A R 4 5 fers is their design aesthetic. Take into account the overall atmosphere of the spa. Is it trendy? Is it luxurious and plush? What colors do they use? What branding is applied? Do they have a logo or is it a simple wordmark? The more information of this type you can gather, the more likely the samples you send will appeal. Also keep in mind that the branded items a spa offers are part of building the experience for the customer, so there has likely been some thought put into the kinds of items offered and the look and branding of those items. Unless, somewhere in the process, the spa mentions they are looking for a branding update, it is best to stick closely to whatever information you've gained from your visit and ex- amination of their goods, or to what- ever guidelines the spa might provide for its decorators. Another good way to find out about a spa is to follow them on social media. In today's world, social media feeds are a large part of the branding for many companies. Following a spa on Face- book, Twitter, or Instagram will give you a sense of their design aesthetic as well as how the spa presents themselves to po- tential customers. It is also wise to use your own social media feeds to emphasize what you can offer to businesses in that market- place. Social media can be both a research and sales tool, so make sure to exploit all the information and contact opportunities it offers. 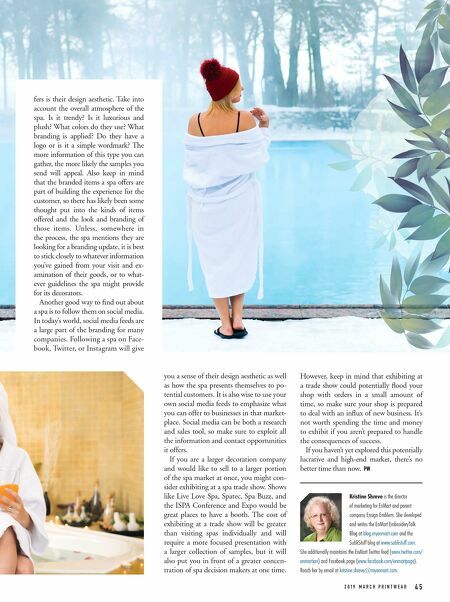 If you are a larger decoration company and would like to sell to a larger portion of the spa market at once, you might con- sider exhibiting at a spa trade show. Shows like Live Love Spa, Spatec, Spa Buzz, and the ISPA Conference and Expo would be great places to have a booth. The cost of exhibiting at a trade show will be greater than visiting spas individually and will require a more focused presentation with a larger collection of samples, but it will also put you in front of a greater concen- tration of spa decision makers at one time. However, keep in mind that exhibiting at a trade show could potentially flood your shop with orders in a small amount of time, so make sure your shop is prepared to deal with an influx of new business. It's not worth spending the time and money to exhibit if you aren't prepared to handle the consequences of success. If you haven't yet explored this potentially lucrative and high-end market, there's no better time than now. PW Kristine Shreve is the director of marketing for EnMart and parent company Ensign Emblem. She developed and writes the EnMart EmbroideryTalk Blog at blog.myenmart.com and the SubliStuff blog at www.sublistuff.com. She additionally maintains the EnMart Twitter feed (www.twitter.com/ enmartian) and Facebook page (www.facebook.com/enmartpage). Reach her by email at kristine.shreve@myenmart.com.